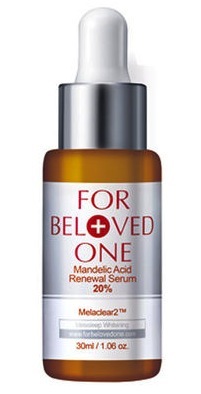 The 20% high-concentration Mandelic Acid (PH 3.5) is highly skin-friendly and can penetrate deep into the pores to remove acnes and prevent melanin formation to improve skin darkness. In addition, the patented Melaclear 2 TM moderately eradicates the old cuticles on the skin surface. Safe, lowly-sensitive and lowly-iritating , the formula is food for skin care at home with a whitening and translucent effect . Rub proper amount evenly onto the face and tap the face until full absorption. Better effect is obtained when used with the "Vitamin C Essence" and "Melasleep". The whitening effect can be multipiled if used with extract or lotion. Use this 3 times a week . Price at S$95.00 for 30ml at Singapore Sephora.